We had mixed feeling about our Superb Internet hosting experience. While their cheapest shared plan, GridLITE, lacks in unlimited features, it does provide adequate resources for the vast majority of shared hosting users. Positives include: price; disk space, 24×7 support, a 99.99% uptime guarantee, a 30-day money-back guarantee, and an “A” BBB rating. On the negative side, the myCP control panel lacks in both functionality and usability. 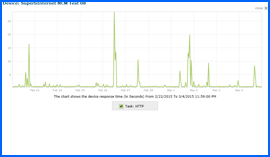 Further, our test site page-load speeds were amongst the slowest recorded to date. In the final analysis, Superb Internet has earned the NCM Online designation of NOT RECOMMENDED. Headquartered in Honolulu, HI, Superb Internet utilizes datacenters in Seattle, WA; McLean, VA; Springfield, VA; and Manhattan, NY. One of the oldest continually-operating web hosting firms in existence, Superb offers three shared plans: GridLITE, GridPRO, and GridMAX. All three plans include unlimited traffic, daily data backups; the proprietary myCP control panel; the proprietary One-Click Applications Installer; site stats, e-mail anti-virus/spam protection, webmail access, e-mail forwarding, and e-mail autoresponders. All three plans are backed by 24x7x365 phone, chat, and e-mail support; a 100% network uptime guarantee, a 99.99% server uptime guarantee, and a 30-day money back guarantee. All shared plans include a free domain name (1 year with 1-year plans and 2 years with 2-year plans). The cheapest shared plan, GridLITE, includes: 20GB of disk space, 1 FTP account, up to 11 domains hosted, 1000 POP3/IMAP mailboxes (1GB), up to 10 mailing lists, and 5 100MB MySQL databases. The GridLITE plan is priced at $8.99 per month for monthly-terms, $7.99 per month for 3-month terms, $6.99 per month for 6-month terms, $5.99 per month for 12-month terms, and $4.99 per month for 2-year terms. 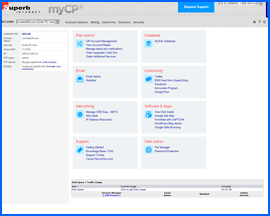 The proprietary myCP control panel. It does not provide the range of functionality or the ease of use of the cPanel or vDeck 4 control panels. Click to enlarge. The next-cheapest shared plan, GridPRO, includes: 200GB of disk space, 20 FTP accounts, up to 50 domains hosted, 2000 POP3/IMAP mailboxes (2GB), up to 15 mailing lists, and 25 250MB MySQL databases. The plan also adds: SSH access, raw log file access, and Cron jobs. The GridPRO plan is priced at $11.99 per month for monthly-terms, $9.99 per month for 3-month terms, $8.99 per month for 6-month terms, $7.99 per month for 12-month terms, and $6.99 per month for 2-year terms. The highest-priced shared plan, GridMAX, includes: unlimited disk space, 50 FTP accounts, unlimited domains hosted, 4000 POP3/IMAP mailboxes (4GB), up to 20 mailing lists, unlimited 250MB MySQL databases, and a dedicated IP address. The GridMAX plan is priced at $18.99 per month for monthly-terms, $17.99 per month for 3-month terms, $16.99 per month for 6-month terms, $15.99 per month for 12-month terms, and $14.99 per month for 2-year terms. The proprietary Superb Internet One-Click Installer. Click to enlarge. While we’d prefer to say the Superb Internet checkout process is quick and easy — we’d be lying if we did. We found the shopping cart to be inefficient and confusing, and in need of updating. For instance, we were required to enter our name and e-mail address twice — in Step 1 and again in Step 4. Additionally, the shopping cart repeatedly informed us that — “Your total initial payment (includes one-time setup fee)” — despite our understanding that Superb does not charge setup fees on shared accounts. We called Superb Support to clarify the set up fee policy. The hold message indicated that we were “#1 in line” with an expected wait time of approximately 2 minutes. After waiting 16 minutes, we hung up. To the best of our knowledge, we were never charged a set up fee. Approximately 3 hours after placing our order, we received the Superb Internet “Welcome” e-mail. While it did provide the control panel and FTP logins, it did not include the nameserver information required to set up our test site quickly. However the e-mail did provide a link to a “Getting Started Guide” which listed the nameservers. We then returned to our FTP client and substituted “ftp.gip.superb.net” for the IP address. We were then able to connect to the server and upload our test site via FTP. While we’d prefer not to dwell on negatives — by providing erroneous information — Superb had transformed the relatively simple task of uploading our test into a tedious and arduous process. Superb Internet provides the proprietary myCP control panel (screenshot above right) with shared hosting plans. While we admire the simplicity of its design, it does not provide the extensive range of functions included with the cPanel or vDeck 4 control panels. Further, the function interfaces are outdated and seem difficult to use when compared to modern control panels. 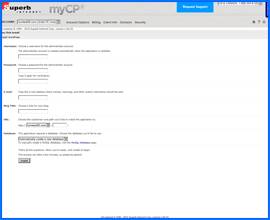 In serious need of updating, the myCP control panel would benefit greatly from a complete overhaul. Superb Internet WordPress installation interface. Click to enlarge. Superb devotes an entire page of its website to promoting its “Huge library of FREE apps.” In fact there are 34 free applications available with the Superb One-Click applications installer. These include: WordPress, Drupal, Joomla, Magento, phpBB, Simple Machines Forum, Zen Cart, and others (screenshot above right). However, a good number of popular apps are nowhere to be found. These would include: AbanteCart, b2evolution, ClipBucket, Concrete5, Dolphin, MyBB, PHP-Fusion, PrestaShop, WHMCS, et al. The industry-standard Softaculous applications installer — and its prime substitute, the MOJO Marketplace installer — generally provide access to a minimum of 100 free applications, and often include more than 300. 34 apps may have been considered a “huge library” 10 years ago, but things have changed. Once again, it would seem that when it comes to best practices, Superb has fallen behind the times. For the benefit of those considering Superb as a host, and to prevent any confusion, we decided to list the apps available with the Superb Internet One-Click applications installer. In its defense, we did find the Superb One-Click applications installer to be quick and easy to use. We were able to install WordPress in less than one minute. See WordPress installation interface screenshot above right. Superb Internet Web Hosting 10-day Uptime Test Results Chart. Click to enlarge. All web hosting services reviewed by NCM Online are purchased and subjected to our 10-day test for uptime and speed. Utilizing third-party testing service, Dotcom Monitor, identical NCM Test Sites undergo approximately 2000 separate checks performed by 13 worldwide test locations. Speed and reliability testing began on 2/22/15 and concluded on 3/4/15. Utilizing our simple 1-page test site (click for sample test site), Superb Internet was subjected to a total of 1056 uptime server checks from 13 worldwide locations over the course of the 10-day test period. Despite a single TCP 10060 error reported by our Virginia test location on 3/4/15 at 04:59:48 PM, we are pleased to report that Superb achieved a perfect, 100% reliability score (see Uptime Test Results screenshot above right). Superb Internet Web Hosting 10-day Speed Test Results Chart. Click to enlarge. Unfortunately, the page-load speed test results were more than just disappointing, they were awful. Superb Internet recorded an average speed of 3.3757 seconds to load our simple single-page test site from 13 locations worldwide, and 2.4997 seconds from 7 U.S. locations (see Speed Test Results screenshot right). 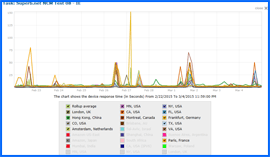 It is worth noting that worldwide page-load speed was the second slowest we have recorded to date. Only JaguarPC was slower — and they experienced significant downtime — accounting for much of the skewed page-load speed results. Based on what we know of Superb’s datacenters and network, we can only surmise that when it comes to shared hosting, the company is utilizing slow and outdated server technology. Erroneous information provided in “Getting Started” guide. Throughout our Superb Internet hosting experience, we could not help but feel that this was a company beyond its prime. Despite a number of positives, major ease-of-use issues and deathly-slow page-load speeds prevent our endorsement at this time. Superb Internet has earned 3.5 stars and is not recommended. Cheap website hosting company price comparisons based on 1-year term list price before coupon/promo codes or limited time/introductory offer discounts. These are the renewal rates for the second year of hosting. To ensure that you receive the most affordable Superb Internet Web Hosting pricing possible, please visit our Web Hosting Coupon Codes page for current discounts and special offers before making any purchases. 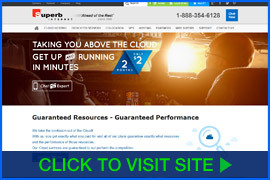 Superb Internet Corporation was formed early in the internet age as a result of Superb Entertainment’s inability to find reliable web hosting. Between 1994 and 1996 Superb Entertainment (the collective for game development lead by Haralds Jass) had to switch Internet Presence Providers (IPPs) several times because of frequent downtime and other problems. Superb Internet was created on the principle that fast and reliable hosting, with 100% uptime, should be available to anyone for whom a presence on the internet was essential. As a result of meeting this newly emerging need, the company grew quickly. In 1996, its first year, the firm increased the number of websites hosted from zero to hundreds and increased its Sun Solaris servers from one to three. Things really took off for Superb Internet in 1997. It increased its number of servers from 3 to 21 and the number of websites hosted from hundreds to thousands. It also added PC server support in addition to Sun Solaris. The company quickly acquired the status of one of the top 50 largest hosting companies. Its reputation for reliable, high-quality support and service spread rapidly through word of mouth. Due to such massive growth during 1997, the center for physical data was repositioned to Annapolis, Maryland, a site that had better connections and was more centrally located than the former Greenbelt, MD site. Superb Internet premiered two industry firsts in 1997 that allowed the company’s growth to reach new heights. It undertook the first commercial implementation of virtual hosting on a name, rather than IP basis, and offered this hosting at a cost-effective rate. It also began unlimited third-level domain hosting, with a unique site for each such domain (e.g. *.domain.com) and complete user control of the site in real-time. In 1998, Superb Internet increased its Internet bandwidth capacity over 15 fold, adding 37 physical servers to reach a total of 58. It hired more than three times as many staff so it could provide 24/7 coverage for its international customer base. In 1999 the company increased its servers from 58 to more than 100. It introduced its new global headquarters located in the City of Vancouver, British Columbia, Canada. In 2000 the company replaced its third party data center in Annapolis, MD with its own data center located in Georgetown, Washington, DC. An integral part of this move was the introduction of a dedicated OC-12 SONET ring operating inside the DC/VA/MD metropolitan region to replace the former OC-3. This allowed for the quadrupling of total bandwidth capacity. The company founded an office for support and sales in New Delhi, India and increased its phone support to 24 hours a day. Web Hosting Magazine named Superb Internet a Top 3 Reseller Host in 2001. At the Web Hosting Expo the company received the esteemed Best Host Award for shared hosting. Haralds Jass, the company’s President and CEO, also was chosen as the field’s Most Conscientious Citizen. The company inaugurated a second data center in the Tyson’s Corner section of McLean, Virginia, on January 20th, 2003, thus quadrupling data capacity. At the same time the company entered the new affordable dedicated server marketplace by adding a SuperbServers.net division. Superb initiated a new system for orders and a dedicated server configuration in 2004. These allowed customers to tailor their server online, save and share the reconfiguration, request a return sales call, or place an order – thus beginning a new age of automation and self-service. That same year the company expanded its local IP network, which had covered the Washington, DC – New York Metro area, into a coast to coast IP backbone, by extending it up to Chicago and out to Palo Alto, CA. and greatly increasing capacity in the New York, NY center. A third data center in Seattle, WA was launched by the company in 2005. The capacity and redundancy of the coast-to-coast IP network was increased by many fold, resulting in an explosion in the customer bases for real-time financial services and game server resellers. In 2008, Superb Internet began building a fourth data center in Springfield, VA in order to meet Washington, DC’s high demand for dedicated servers and colocation. This center almost doubled east coast data center capacity. In 2009 corporate headquarters were moved from Vancouver, BC to Honolulu, HI, allowing for improvements in operations efficiency. The next year Superb Internet had all data centers, operations and networks become SAS-70 Type II (now SSAE-16 SOC-1 Type II) audited and certified in order to meet the compliance and certification standards required by large financial services and institutional customers. When the firm acquired the comprehensive ISO 9001:2008 certification for quality control, it became one of the most broadly certified web hosting companies. In 2011 Superb Internet upgraded its network security upgrades to prevent hacking activities and AUP violations, thus becoming a leader in network security. During 2012 the company performed a massive overhaul upgrade to their coast-to-coast IP backbone, in order to satisfy rapidly growing traffic volumes and increased demand for 10 Gb/s service by institutional IP transit customers. The capacities of all network PoPs were increased to a minimum of 200 Gb/s and many were upgraded to 640 Gb/s. In 2013 the company launched a new cloud platform that provides higher performance I/O and transfer speeds than those of competitors. This video tutorial will show you exactly how to install WordPress on your Superb Internet shared hosting account using their proprietary control panel and applications installer.